Pete Czerwinski was hospitalized for anorexia as a young man. He weighed 120 pounds and his organs were so taxed that his heart was about to fail. He received comfort and support from his family, particularly his mother who battles disease of her own, and began recovering during the lengthy bed rest. Once he was released from hospital Pete began an intense fitness and bodybuilding regimen. His appetite returned in spades. Following a night out with friends, Pete consumed four massive hangover helping breakfasts on a dare. Other restaurant patrons gathered around the delicious spectacle, and Furious Pete was born. A great deal of time is spent talking about Pete's battle with anorexia as well as his parent's trials with illness. Czerwinski has been through a lot and is not shy about sharing it. He is a warm and open man and the film would not work at all were he not. His unassuming character and unlikely carriage for a competitive eater make him a great subject to follow into this world. There is nothing visually remarkable about Furious Pete, but it is shot well and edited cleanly. However, the great burden of budget documentaries, stock music, does pops up again here (music is credited to Stockmusic.net). Pete Czerwinski is followed on his daily training routines as well as on the road to professional eating competitions. Watching competitive eaters eat is disgusting, particularly in slow motion. It is also wildly entertaining. The eating scenes in Furious Pete may be some of the purest pleasures and gross outs of my film going life. As a bonus, I appreciated the chance to witness competitive eater trash talk. Getting trash talked by a grown man in overalls seems like it would be particularly galling. During these travels the politics of the different professional eating leagues are also brought to light. Yes, there are professional eating leagues. Plural. I could have probably watched an entire film learning about their origins and watching the jostling between organizations, but the broad strokes are covered in the way they relate to Pete's story. 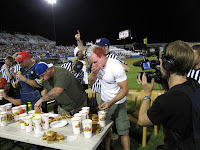 The weakness in Furious Pete is that at no point does the director ask, "Do you think competitive eating is just the flip side of your eating disorder? 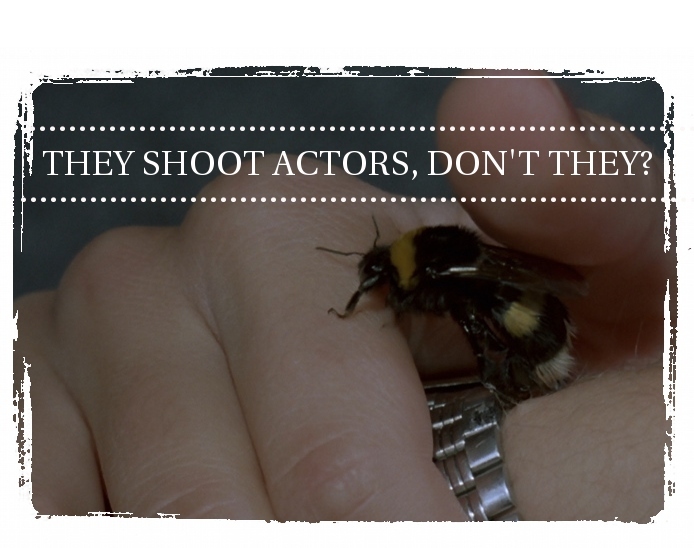 Is it another way to control your environment? Do you think it is ultimately as harmful as your anorexia was?" That's a shame, because I really would have liked to have seen that probed into. There is slight attention paid to the possible health ramifications of Pete's eating, but he is given a clean bill of health on camera and it is left at that. The director clearly had a certain tale in mind, though, and I understand those questions would interfere with the feel-good vibe of Furious Pete. If you are looking for a hard hitting investigation you can forget it, but Furious Pete does offer a unique, if light, glimpse at a strong man and his gross world. The great pay off of the film is finally seeing Pete eat a 72 ounce steak in real time over the closing credits. Three camera set-up, running clock, completely captivating. The Story of Furious Pete plays Hot Docs on April 30 and May 9. Check here for schedule and watch the trailer here.